The war between Defence minister Geoffrey Mwamba (GBM) and Fred M’membe using Wynter Kabimba has now sucked in Chishimba Kambwili, the sports Minister. Chishimba Kambiwili’s troubles stem from his support for and solidarity with Mwamba. Kambiwili is said to be one of the ministers who have pledged to support GBM and if need be, go with him. Kambwili is being fought using government controlled newspapers, especially the Daily Mail under play boy Antony Mukwita. The idea is to embarrass and humiliate him and eventually frustrate him. Kabimba and his group have instructed civil servants journalists to be on the lookout for any negative stories that involve Kambwili and publish them. A team of PF journalists and cameramen was immediately dispatched to Luanshya to get photos of the said cows and also interview anyone with anything negative to say about Kambwili. 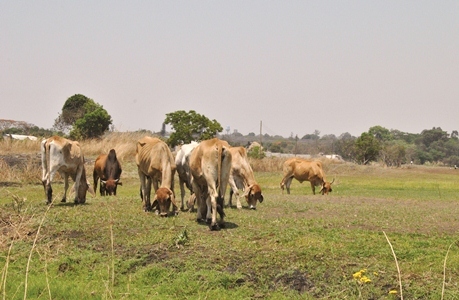 The story under the headline stated that, ‘golfers at Roan Antelope Golf Club in Luanshya say their play is being impeded by Sports Minister Chishimba Kambwili’s livestock that stray onto the course’. “We are actually tired with complaints about the minister’s animals. We cannot play golf properly and he seems not to care that his animals are disturbing us,” one golfer said yesterday at the golf course as cows, goats and sheep enjoyed the lush green grass around holes five and seven. The golfers also contend that the minister’s farm has encroached the golf course and they wonder who authorised its location. “We also wonder who allowed him to bring such animals to his plot when this is not a farming area. The minister must remove his animals as his house is among the 18 houses that have encroached the golf course,” another golfer said. “The minister is among the several people that have built houses around the golf course we need help from people like him but instead he is on the other side so where can we go when we have such a problem,” a club member complained. Ordinarily in the government owned but PF controlled newspapers, such negative articles against PF officials and ministers are not published. But the government newspapers are controlled by Amos Malupenga, the permanent secretary in the ministry of information and George Chellah, state House spokesperson, both former employees of Fred M’membe. The link is easy to follow. Just yesterday, October 17, 2012, the Daily Mail found something else negative to embarrass Kambwili with. ‘Livingstone council rejects Kambwili’s order’, was the screaming headline in the Daily Mail. The story went as follows: ‘Livingstone City Council has rejected Minister of Youth and Sport Chishimba Kambwili’s directive to repossess the town centre swimming pool from former Southern Province Minister Alice Simango.